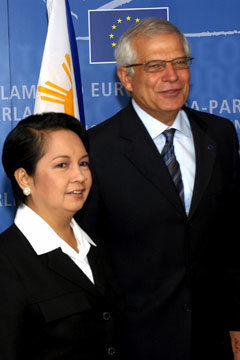 European Parliament President Josep Borrell welcomed Philippine President Gloria Macapagal Arroyo upon her arrival Wednesday in Brussels, Belgium. Arroyo will be in Hawaii tomorrow. Drivers planning to be on the road tomorrow between Kahala and Waipahu might want to allow extra time for potential traffic tie-ups. Police and the Secret Service will be closing roads and freeway onramps for Philippine President Gloria Macapagal Arroyo's motorcade in the afternoon as she travels between Kahala, the Filipino Community Center in Waipahu and the National Memorial Cemetery of the Pacific at Punchbowl. In addition to the motorcade, parts of Ala Moana Boulevard and Kalakaua Avenue also will be closed as the Aloha Festivals parade passes, and it is the season opening game for the University of Hawaii football team, which could create traffic around Aloha Stadium. "We're advising motorists to expect possible traffic delays resulting from President Arroyo's visit," Honolulu police spokeswoman Michele Yu said. Yu said roads will be closed only as necessary for Arroyo's visit and will be reopened once the motorcade passes. Philippine Consul Susie Natividad said Arroyo is staying in Kahala rather than Waikiki to avoid creating further road closures during and after the Aloha Festivals Parade. The parade -- with 3,000 marchers, nine vehicles, 25 bands, 15 floats and 12 pa'u horse units -- is scheduled between 9 a.m. and 1 p.m., beginning at the Ewa end of Ala Moana Beach Park and continuing down Ala Moana Boulevard to Kalakaua Avenue and Kapiolani Park. It is unclear when Arroyo will be traveling from the airport to Kahala. Her arrival -- possibly Saturday morning or Friday night -- and her departure have not yet been announced, Natividad said. The Philippine president, who is here to help celebrate the 100th anniversary of Filipino immigration to Hawaii, has meetings scheduled in Kahala on Saturday morning, Natividad said. She will leave Kahala to be at the Filipino Community Center in Waipahu at 2 p.m. The motorcade will then travel from there to the National Memorial Cemetery of the Pacific at Punchbowl for a ceremony that is scheduled to begin at 4 p.m. The Punchbowl ceremony will end between 5 p.m. and 5:15 p.m., when Arroyo is expected to head back to Kahala. Her last event is a reception at Washington Place that is scheduled to start at 7:30 p.m. and end around 9 p.m.
"We've been assured by HPD that they will do everything to assure that there is as little impact on the traffic flow for the Warrior game as possible," said Patrick Leonard, a spokesman for Aloha Stadium. The UH athletic department estimates about 27,000 people will attend tomorrow night's 6:05 p.m. game. Traffic is normally heaviest between 2 and 3 p.m. and between 5 and 6 p.m., so it is best to travel between 3 and 5 p.m. to avoid traffic, Leonard said. Cars will not be allowed to line up outside the parking lot before 2:30 p.m., when the gates open. ESPN radio 1420 will also be broadcasting traffic updates for people going to the game, he said. At the Filcom center, Arroyo will be dedicating a statue honoring the sakadas who came to Hawaii to work in sugar and pineapple plantations. About 450 people have been invited to the ceremony, said Geminiano "Toy" Arre, president of the Filcom Center. The ceremony at Punchbowl will honor Filipino and American soldiers who died in the Philippines during World War II. The cemetery will be closed to grave site visitors at 10 a.m. because of security for Arroyo's visit, but the ceremony will be open to the public. Special buses will take people from the Honolulu municipal building parking lot to Punchbowl beginning at noon. Philippine President Gloria Macapagal Arroyo's only appearance open to the public will be at a ceremony to honor American and Filipino soldiers who fought in the Philippines during World War II. The National Memorial Cemetery of the Pacific will close to grave site visitors at 10 a.m. tomorrow for the 4 p.m. ceremony, where Arroyo and other dignitaries will speak and the Philippine president will lay a wreath and dedicate a memorial plaque. Buses will take people from the Honolulu municipal parking lot to Punchbowl. Seats can be reserved by calling the Philippine Consulate at 595-6380 or 595-6316 to 19, ext. 223 or 228. Parking will not be allowed at Punchbowl. The buses will depart for the ceremony starting at noon and run about every half-hour until 2:30 p.m. Buses will return to parking areas starting about 5 p.m.
Handbags, briefcases, backpacks and similar items will not be allowed in the ceremony area and will be confiscated if brought in. Cameras and sun umbrellas are permitted.